Led by our cities oldest and original guided bicycle tour company. You’ve seen the French Quarter. You’ve been to the bars crowded with other tourists… Are you ready for a taste of the real city? New Orleans is home to beautiful architecture and an incredibly colorful past, with a history and culture unrivaled in America. What makes it so interesting is that on every street the past is interwoven with the present; In the Marigny, you’ll bike past people walking their dogs on land that a plantation owner lost over a lifetime of craps games. Or, a few blocks away, you may get waved at by local folks sitting on porches next to bars that have been there for generations. 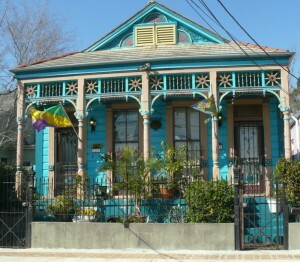 The neighborhoods are filled with historic houses with all the beautiful archtiectural detail that comes from our Creole past. The neighborhoods are filled with restaurants; both decades old and newly renovated, parks, and monuments that hold amazing stories of the city’s past. We will bring you close up and into the heart of it all, and we’ll bike the way all of us locals do – on classic cruisers with overstuffed spring seats and upright handlebars, no multiple speed bikes here…we only have one: casual. Starting down-river from the French Quarter, we will cruise the narrow streets touring the Faubourg Marigny and the Bywater, early 19th century New Orleans suburbs. Originally home to the Creoles and Free People of Color, and later the Irish and Italians, this neighborhood now belongs to the art galleries and musicians, although the bars haven’t changed through all of that. The decorative facades of traditional shotgun houses and corner stores set the perfect backdrop to begin our journey. Continuing, we wind our way along the oak-lined beauty of Esplanade Avenue, peddling past antebellum mansions towards the Treme, home of the largest settlement of Free People of Color in the pre-Civil War era, today still the residence of traditional brass bands and social clubs. Sound good? Well, that is only a small taste of what we may share: local heroes like Ernie K Doe; the musical culture of the Treme and neighborhood parades and Jazz funerals that fill our streets will be explained. Local sights and oddities will be seen and plenty of stories will be shared. There is so much to see in New Orleans, and we customize each tour on the spot based on your mood, your interests and questions, the weather, even if you are in the mood for a Bloody Mary, or Abita beer at one of our many neighborhood bars, we can make that happen; the tour is yours. At the rest stop (conveniently located at a classic New Orleans neighborhood bar where you can cool off on hot days and warm up on the cold ones, the important subject of what and where to eat, drink, and see music will be covered as we make sure the time you spend after our ride is as good as the ride itself; we are New Orleans hosts, this is what makes us happy. This sounds like a lot, and it is, but the neighborhoods are close and filled with sights. We promise, you will not be bored. And it’s not even close to exercise. We only ride in small groups so you can truly see what you want, and we cover about 6 miles so we can take it easy with a chance to enjoy it all. See a house with intriguing architecture and a beautiful paint job that you want a picture of? Just say the word. Want a refreshing raspberry snowball to help beat the heat, that can be done, too. A cold Abita on a hot day. 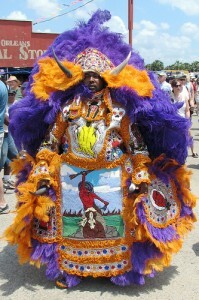 We hope to offer an opportunity for you to discover and enjoy New Orleans to its fullest. And when we’re done, you can return home finally knowing the difference between a Y’at and a Who Dat. We supply the friendly guide, tuned-up bicycles, safety helmets for those who want them, and an encyclopedic knowledge of the colorful past of the Big Easy. We’ll even supply bottles of ice water…you needn’t bring anything but pedal power. That’s a pretty fair deal isn’t it? Time: Tours available 7 days a week (Closed Tuesdays during the summer) in both the morning and the afternoon by advance reservation. Email us from our contact page or give us a call at (504) 400 5468 so we can set something up that works for you. Starting Point: We meet up in on the Royal Street side of Washington Square Park between Frenchmen and Elysian Fields Ave; a pleasant walk from anywhere in the French Quarter. A map of our starting location can be found here.